You know that spring has officially arrived when the sound of lawnmowers begin buzzing about the neighborhood on a Saturday morning. Cutting the grass has been a time-honored tradition for kids who want to earn an allowance. Homeowners who take pride in their front yards don’t mind putting in an hour or two to get the job done. As with any kind of DIY project, you need the right tool. How is your lawnmower running? Is it time for a new model? You’ll have plenty of options when it comes to picking out a mower. The lawnmower that is the most fun is the self-propelled variety otherwise known as the riding mower. Depending on your yard slopes, you can get front or rear wheel drive and hit speeds of up to 3.5 MPH. You won’t win any races on the track but you can certainly make quick work of cutting your grass. Old school lawnmowers are the kinds that are gas powered and propelled by your pushing. If you like that kind of mower, you don’t have to stay trapped in the 50s. You can get a mower with an electric starter not unlike what you would find on your backyard grill. One touch and you’re on your way. Lawnmowers with variable speeds allow you take more control when working in close quarters like around a tree or garden beds. When you’re out in the open, you can crank up the blades for smooth cutting. New lawnmowers also have a blade-brake clutch system. This lets you stop the blade from spinning but keeps the motor running. When you can do that it will be easy to remove an obstacle without interrupting the flow of your mowing. And you’ve got to keep that flow! There are 100% electric lawnmowers which require plenty of extension cord length. These are probably a better option for smaller yards. 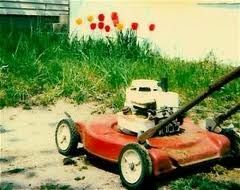 No matter which type of new mower you plan on buying you’re going to have to get rid of the old one first. A lawnmower would definitely fall under the “Too Big to Throw Out” category of trash. For that kind of removal, Junk King Cincinnati is the call to make. Junk King is the Cincinnati based business that has elevated the junk removal process. With every Junk King appointment, you’ll have a team of dedicate and professional movers able to load up anything you’re throwing away on the back of their truck. Yes, you’ll also have a truck to fill up. Imagine all the time and effort it would take for you to rent a truck for hauling? When you’ve got Junk King on the job you can get rid of that old lawnmower and any other bulky item without a second thought. Give Junk King Cincinnati a call today and get your junk gone for good! This entry was posted in Cincinnati Appliance Disposal, Cincinnati Junk Hauling, Cincinnati Junk Removal, Lawn Mower Disposal and tagged Cincinnati Lawn Mower Disposal, Lawnmower disposal on April 22, 2013 by Peter Mccreary. Last updated August 2, 2017 .